Outdoor Lighting La Grange: Get Ready for Spring! While it may only be the beginning of February, and Chicagoland is still experiencing winter weather, your mind might be on spring and what it will be like to sit outside again. 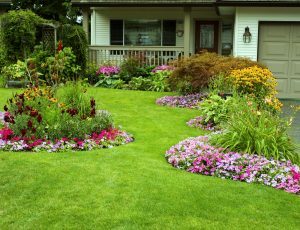 You may have grand plans for your front and back yards, and there’s no better time than now to begin thinking about the decor and lighting you want to add. At Hortons Home Lighting in La Grange, we can help you choose new outdoor lighting, furniture, and more to make your springtime complete. If you’re adding a new outdoor seating area, or you want to update your current backyard space, one of the best places to start is with the lighting. You want people to be able to see after the sun has set, and pathway lighting is a great way to illuminate your garden and landscaping while also ensuring safe footing. If you have a deck with posts, adding pier lights can be a perfect way to add a bit of design to the outdoor area. Those with a gazebo or pergola can add multiple strings of bulbs to create that outdoor cafe feel that provides the perfect ambience for entertaining. You’ll also want to think about security lighting and keeping your home safe after dark. Motion and sensor lights will alert you when something or someone approaches the house, and automatic lights are also good for those times when you arrive home late at night. Setting up outdoor lights on timers is an ideal way to deter trespassers and keep you safe. 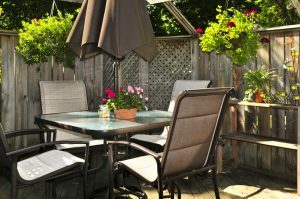 A new garden space or seating area is a great way to welcome spring, and once the weather cooperates, you’ll want to sit outside as often as you can. On top of an outstanding lighting selection, Hortons carries a great inventory of outdoor furniture and seasonal decor that will make your outdoor space feel like your indoor living room. Adding tables, chairs, umbrellas, and more will create a unique space that’s inviting and comfortable, and you’ll have enough room and seating to have friends and family over whenever you want. We also carry outdoor ceiling fans that can provide proper airflow in those exterior spaces with an overhang or covering, such as a porch or a gazebo. If you’re starting from scratch on your new outdoor area, you probably have dozens of design ideas floating around in your head. You may want a simple garden area where you can drink your morning coffee and read the news, or you may have plans for a grand fire pit and seating area where you can entertain the neighbors. No matter what you have in mind, our lighting and design experts can help you make your ideas a reality. We can start with your new outdoor fixtures and match them with decor and furniture, and create a comprehensive plan that includes all the desired aspects. When you’re ready for spring, come to Hortons for the best outdoor lighting and decor!